No doubt you have seen the new changes with Child seat law, but how much do you really know? The Law is about to change regarding Child seats, the biggest change in driving laws for over 20 years. This is being enforced from the 18th September 2006 - The hope is that it will save up to 2000 Children's lives a year. Be one step ahead with the new seating laws, or you could face a fine upto £500 or a £30 on the spot fine. The new child restraint laws come in on Monday under a new European Directive. All children travelling in a vehicle under the age of 12 will have to use some form of child car seat, unless they exceed 135cm (4ft 5in) tall. However, this has not been documented enough, and people are awakening to find that they are obliged to purchase new car seats or booster cushions for their kids. The biggest problem is to get a child who is used to travelling without one, to start using them again. What are the new guide lines? I expect police to use common sense, not put out major dragnets... but to appear at the school gates from time to time to give people advice. Any child under 135cm (4ft 5in) tall, unless have had their 12th birthday must use a child seat or restraint appropriate for the child's weight. Which type of seat should I use? We recommend you weigh your child and consult the folowing guide their are many online shops selling a range of child seats, child restraints and child booster seats to suit the recent child seat law. A booster seat is similar to a booster cushion, however it has a back, and also sometimes has a level of protection for a child's head, giving support in a side impact situation. The government strongly suggests that you try the seats before you buy them, as it is imperative that the Child seat fits perfectly in your car. Are any children not affected by the new Child seat laws? Any children over 12 yrs old or taller than 135cm tall, may use adult seat belts. The Department for Transport still recommend children should continue to use booster seats or cushions until they are taller than 150cm (4ft 11in). How do the new laws affect the existing child restraint laws? Until now children aged 3 to 11 have been obliged to sit in child seats or use an appropriate seat or cushion. 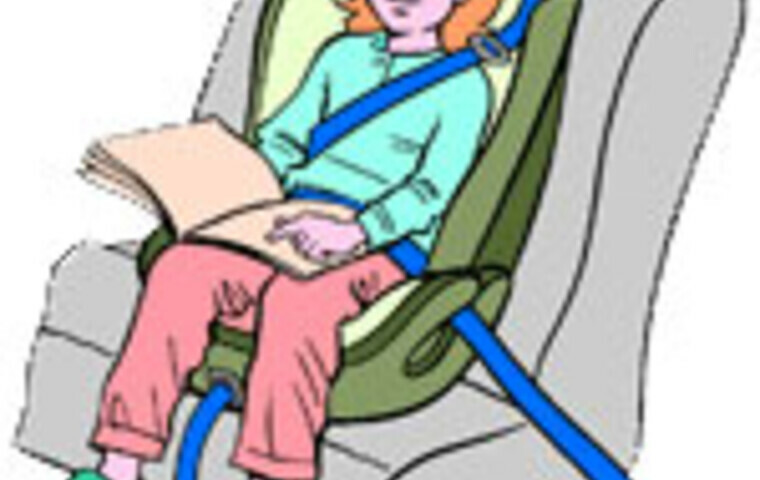 The Law states now 'There is no exception - all children have to use a Child Seat or restraints including boosters. Children aged 12 and not taller than 135cm, cannot travel in the front without a child seat or cushion, there are no exceptions. Whats the flexibility with the new law, is there any? Two children already using restraints in the rear seat, therefore leaving no room for a third. (In this case it would often be safer for the child to travel in the front using a booster seat. In older cars fitted with no rear seat belts - children aged between 3 and 12 may travel in the rear seat, the Department for Transport disapproves and states this is not safe for children. All Emergency vehicles - ambulances & police cars, are exempt from all child seat laws. The car pages, everything you'll ever need about cars, history, fastest motors even the priciest. MOT test time can be a challenging time unless your car is under the government set limit for new vehicles of 3 year or is exempt from the test, however Planet Auto has eased your challenges and solved the problem of a surprise bill with this simple checklist you can carry out yourself - giving you the chance to fix and replace any parts and or issues that will deem an MOT inspector to query your Pass. Goods vehicles powered by electricity. Buses, Lorries and Trailers require something called an Annual test. Remember switch off your engine before looking under the bonnet, and if your working in the engine disconnect your battery too and above all - Always Take Care. This guide should give you enough of an insite into what is entailed in a Ministry of Transport Test and what to check, repair or replace in order to pass it. The majority of the pre MOT checklist items are easy to carry out , however always take care when checking these pre test check points. Car seatbelts with no tears or slices working buckles & fasteners. Seat runners & mountings free from rust structurally sound and in correct working order, with no play. Car mirrors, windscreen, windshield and wipers/washers free from cracks and fitted correctly. All car doors should shut correctly, meaning their should be no rattles, and the doors shut completely flush and be completely secure. This includes sills, sharp edges e.g. cracked bumpers with protruding edges, the car has to be structurally sound therefore free from corrosion where structure is integral to the vehicle. 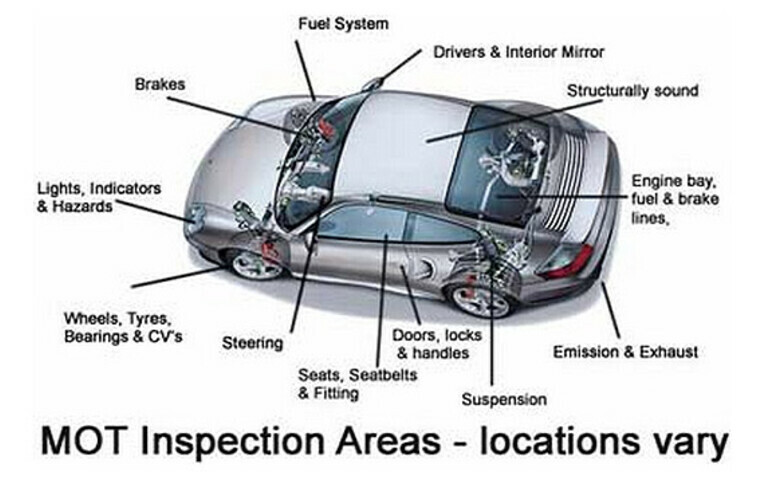 Inspection including fuel & brake lines free from rust and fluid. The exhaust system including downpipe, manifold & rear silencer have to be sealed correctly, no rattles or excessive emissions, the emission acceptance Level is 14, anything under this is acceptable. All tyres need to be of the legal tread 1.6m depth across 2 3rds of the complete tire and have no splits, gashes, bulges or illegal repairs e.g. tire wall repairs - including the spare wheel. The Wheels & bearings need to be in working order with no play. All shock absorbers, mountings, boots, bushes need to be free from corrosion and all dampers have to be free from leaks. The car steering should be smooth this includes the flow and the steering rack if there is any play in the rack this constitutes an MOT Fail, in addition all steering boots, joints & rack have to be in working order with no excessive play. Both the footbrake and handbrake have to be in perfect working order and have to be free from leaks, with no spongyness. The brakes themselves should be in good condition this includes the brake pipes being in working order with no perishing / no leaks and both rear cables to the handbrake fitted correctly with no overhanging cables. The vehicle also should not pull either way when braking or respond with irregular movement e.g. snatching. Hope the checklist has been some help, feel free to print the guide or post the address on your site, in return we will post a link to your website on ours. Always try and get a word of mouth recommendation for your MOT test. Going to a UK garage recommended by family or friend can save you a huge amount of hassle and more importantly money. These MOT checks are relatively simple, if you have a smalll knowledge of cars, the best way is for two people to carry out the pre test checks. In the case of testing the car's electrics, the best way to tackle this is - One operate the car electrics e.g. indicators, brakes etc, the other look to see whether they work satisfactorily. The Electronic parking brake EPB controls now included in test, an EBP must be present and not modified or incorrectly repaired, meaning as to adversely affect the roadworthiness of a vehicle or improperly modified in order to seriously weaken any Electronic parking brake components. NOTE: Any vehicle will fail the test if an Electronic Parking Brake (EBP) warning light is illuminated to display any malfunction. Anti-lock brakes (ABS) has now been extended to include Electronic Stability Control when fitted. The MOT tester will check there is a working and in operable condition an ESC malfunction warning light together non modified wiring, this includes a missing component. The new test includes a steering lock check where fitted as standard. The Power steering fluid reservoir level must be adequately topped in other words above the min level marked on the fluid reservoir. High Intensity Discharge (HID) lamps are now included in the VOSA MOT test. Any car fitted with HID lamps has to have working and non modified levelling and or working cleaning systems, the car etc will fail if the system id in opperative or otherwise obviously defective. Incorrectly aimed headlamp bulbs if not seated correctly will resulting in an incorrect / dazzling beam pattern will be failed. An insecure or leaking car battery is now cause for failure. Insecure or bare wiring, likely to cause a short will result in failure. All trailers and caravans will be required to have a basic security/damage check of all 7-pin sockets installed, any 13-pin sockets will be tested and checked including full electrical connectivity and incorrectly connected or inoperative circuits will result in failure. Any tyre pressure monitoring systems fitted to vehicles 1st registered after 1 January 2012 must be working in accordance with the vehicles manufacturer and not indicating a malfunction. If any airbag fitted as original equipment maunfactured (OEM) is obviously missing or defective the vehicle will fail. A seatbelt pre-tensioner fitted as OEM, missing or deployed will be a reason for failure. Fitted as standard seatbelt load limiters that are missing or folding webbing type limiters that have deployed will result in failure. Any vehicle will also fail if a Supplementary Restraint System (SRS) malfunction indicator lamp shows an SRS malfunction. Any car without a speedometer not fitted, incomplete, inoperative, has any dial glass broken/missing or lack of illumination will result in failure. The driver seat must be possible to secure the seat fore and aft in no less than 2 different seating positions, electrically adjusted seats the motors must move the seat fore and aft. An unopenable rear door from outside is a failure. All doors should be easily opened, locks, hinges etc are now inspected. Modifications or inappropriate reapirs to the towbar assembly will be a reason for failure. A missing catalytic convertor fitted as original equipment, missing or modified will be a reason for failure. In addition from February 2014 the Exhaust check will include a check for a Diesel Particulate Filter(DPF) , if one had been fitted, then removed this will result in an MOT test failure. Damaged, corroded or chafed fuel pipes will result in failure. All plates must conform UK registration laws meaning no modified plates, fonts, spacing, backing material etc. TIP : You do not need two fog lights only the drivers side!!! TIP : You only need your interior mirror and drivers mirror. TIP : You do not need door locks which are visible for a Test. TIP : Look for leaking lines & liquids around these areas. TIP : It will be noticable if the exhaust is blowing, due to a higher tone. TIP : A tell tale sign of a bearing on its way out is a whirr from the wheel when cornering usually only in one direction. TIP : A good way to test the shocks is the bounce test if you push the car down on one corner, and it returns the shock is generally ok. TIP : The best way to find excessive play on a steering rack, is to turn the steering wheel when stationary, if the steering wheel turns, but the wheels DON'T, you have a worn steering rack. Welcome to the easy guide to importing a car, whether its a Parallel or a Grey import... wait a minute, don't worry we will explain everything as well as showing you what to do to save you money, minimise challenges, also what to do when you get it onto British soil, MOT etc. A detailed customer guide to the difference between a Grey & Parallel imports. Where do I start when importing a car into the UK? The easy part of importing a car is choosing what car you want, whether its a Nissan Skyline or Acura NSX Type R, the process is the same. As for the next part, this is usually considered as the hard part of the importing process. However with our easy import guide we make it childs play - we help you weigh up whether it is worth doing, by explaining the whole process. We recommend you check the prices in Europe first, usually cars purchased and imported in the EU (European Union) excluding the UK are often far cheaper than Britain. For example, in Germany or the Netherlands, you could expect to save around 20% on the UK price. A list of main dealers in the EU is available from all major car manufacturers in the United Kingdom. Cars available in the UK as well as on import. Either you can source a car yourself from a country e.g. Japan or the US or you can search the UK for specialist importers who will carry out everything including exporting the car, transactions and converting it for use on UK roads. Cars only available outside the EU. Always try and use a main dealer and contact them by telephone if at all possible, this helps peace of mind, and gives you a port of call in the event of any problems. The language barrier, unless you're importing from Ireland this is where the spoken tongue could be a problem. Just ensure they understand what you're after. The exporter car company knows which country the car is being imported to. The vehicle is exactly what you want, import cars can vary widely, always ensure all your import requirements and the specification is in black & white including the price, delivery date etc, this eliminates slip-ups and covers all eventualities when collecting your import vehicle. The vehicle, if a parallel import must be a UK right-hand drive model with a UK setup e.g. MPH not KPH, and the headlights should be set for UK roads. If any or all of these points are still non-UK they could affect your insurance. The broker may even refuse to insure the auto. Make sure you identify all hidden charges or excess payments before making the transaction. Check to see if the exporter has proof of UK residency. The next part of the process should only be carried out when you are completely happy to proceed, as you need to pay a deposit. This secures the car, however do not pay the complete price at this stage. Some import dealers may prefer or even insist on wire transfer or bankers draft in their chosen currency. Always ensure you receive written confirmation. TIP: Pay with a credit card for your deposit, this adds peace of mind and safegards the process. This also gives you a case for your credit card company. This is where the process varies, dependant on whether you have a parallel or a grey. You must decide whether to get a company to carry out the complete import or if you prefer to pick the vehicle up yourself overseas. Waiting for your import car to be delivered to the main dealer can take an age so be prepared for a few delays and long wait. It may take a matter months from ordering your import vehicle to delivery at the main dealer. TIP: Check for last minute inflation on your cars price, if possible try and agree a price on the import car as soon as you have confirmed your order. When liaising, explain you are collecting the motor from abroad and that the vehicle will display temporary plates whilst shipping to the UK. Make sure you have been issued with a chassis number or at the least you know where it is situated and finally get evidence of Type Approval, and a Certificate of Conformity usually proving the import car meets with EU safety standards - this document is needed when registering the vehicle in the United Kingdom. Now you should settle the outstanding bill and its time for a hearty handshake and final confirmation that the car has temporary export registration or transit plates in preparation for shipping. When you return, make sure you register and license your new import car ASAP. This should take around 14 days, however expect a calendar month at peak periods. Any vehicle registration office (VRO) will issue you with the necessary forms to register your import car. You need the V55/4 or V55/5 for used import vehicles. Now you can happily drive your new motor on UK roads without fear of breaking the law. Since the beginning of motorcar history, the highest accolade for every manufacturer, whether it be Ford, VW or TVR, is to sell the most cars. 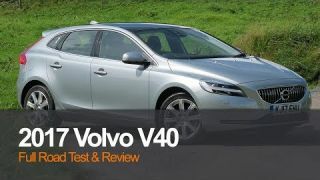 We ask the question which is the best selling car ever in 2012? To give you a lead, we are going to show you the results for 1998. When you look back at other best sellers - for example the Ford Cortina Mk1 back in the late 60's early 70's - it still hasn't made the list. This is due mainly to the model stopping production unlike the car in 1st place, which is still in production, therefore giving it the edge. The Beetle produced since 1937 till 1979 then restarted in 1998. Total Cars sold till 1979 - 21 million. The Toyota Corolla has been in production since its conception in 1963. 20 million cars sold. or known in the US as the VW Rabbit, production started in 1974 and reached 15 million in 1998. Production started in 1970 and reached 13.5 million. There is 1998's best selling cars, any ideas which car is going to win? Best-selling nameplate in car history, production started in 1966 in Japan - the start of the compact car with quality, style and cost-effectiveness of more upmarket models. Nine generations over 40 years, 1997 - best selling car of all time. Over 35 million vehicles to present were sold. The car is one of the wonder cars of Europe. Extremely popular in all Marks. The Golf, a global leader through 5 generations, to present day over 30 million VW Golf cars sold worldwide. In our opinion the best selling car ever and for the fact it kept the same body design for over 55 years. It's said that Adolf Hitler drew its legendary contours on a paper towel. An amazing 21,529,464 VW Beetles were produced, and until 2003, the shape was produced in Mexico. The Ford Model T still holding down after 98 years, the car available in any colour as long as it was black, due to the speed the paint dryed on the first car production line. The Model T Ford sold over 16,500,000 cars, one of the most iconic and best selling cars in the world.